Hudson Robotics has developed a ready-to-use DNA Normalization and RNA Normalization platform that will make this tedious task easier than ever before. Utilizing the simplicity of Hudson’s SOLO Robotic Pipettor, and Hudson’s powerful SoftLinx Scheduling Software, users can perform accurate normalization of any plate of DNA samples. Using the SOLO to perform all the solvent addition, mixing and sample transfer operations, the user need only select the appropriate DNA quantitation data file (for instance, the OD output of an absorbance reader, or electrophoresis results, etc.) , and start the system. Based on user-specified values, like target concentration value, minimum and target finished volumes, the system automatically performs the normalization without any further input from the user. Hudson’s GO (Guided Operation) Wizard will guide the user to put the sample plate, target plate(s), tip box and solvent reservoir in their proper locations on the SOLO, then prompt the user to click ‘RUN’. It’s that simple! Use your time for research, not pipetting drudgery! This system relieves the researcher from time-consuming manual pipetting operations otherwise required to normalize DNA samples, and improves the accuracy and consistency of the final result. The improved accuracy in DNA normalization with Hudson’s system comes from the consistency of the pipetting actions and from the complete avoidance of potential computational errors possible with manual methods. It also completely eliminates any possibility of errors in transferring among the correct plate wells, which is always a possibility when doing DNA normalization pipetting by hand. Efficiency is needed in all your lab operations and no less by DNA normalization. Hudson’s system allows you a minimum of personnel time to do a task which is easy for the SOLO pipettor. You can now spend your time verifying computations, discovering new data and analyzing the results of your measurements. The SOLO is economical and will improve your normailization capabilities many times compared to the manual methods you may now use. Hudson Robotics automated DNA normalization can be easily performed in the clean environment of your choice. Typically, labs performing DNA normalization require the process be performed in a Biosafety Cabinet, clean bench or other HEPA filtered enclosure. The small size of the Hudson SOLO pipettor allows for easy installation in almost any standard-size clean enclosure. This feature alone can save you thousands of dollars and several weeks when setting up you automated DNA normalization process. Your samples are unique! There are several reasons why our clients need to protect their samples. Hudson Robotics understands that most clients would rather have all the diluents delivered to the DNA normalization plate prior to any actual samples being processed. When it comes time to transfer DNA samples to the diluent, Hudson’s unique “Find Well Bottom” feature allows you to access down to the last uL of your samples. The Hudson Solo pipettor can find the bottom of the plate well and gently back off a fraction of a millimeter prior to aspirating. This feature makes sure we have access to all of the available sample volume. Find Well Bottom is a standard feature on all Hudson SOLOs and is included with all of Hudson’s DNA Normalization products. Even with these great features you may want your DNA normalization process customized to fit your specific needs. Hudson DNA Normalization Wizard allows you to design your DNA normalization process around your existing SOPs we don’t force you into a process that violates your current protocols. Hudson’s DNA Normalization System is designed to take the tedium and uncertainty out of manual normalization pipetting steps, and insure accurate, documented normalized DNA samples. Hudson’s DNA Normalization System consists of a SOLO Pipettor with an 8-channel pipette head, a 4-position landscape plate deck, the SOLO DNA Normalization Wizard and a laptop control computer for the operator GUI and to control the process. Optional accessories include a shaker nest and a hand-held barcode scanner. 1. Rapid Normalization (with varying final well volumes): add diluent amounts to destination plate first, then add samples. 2. 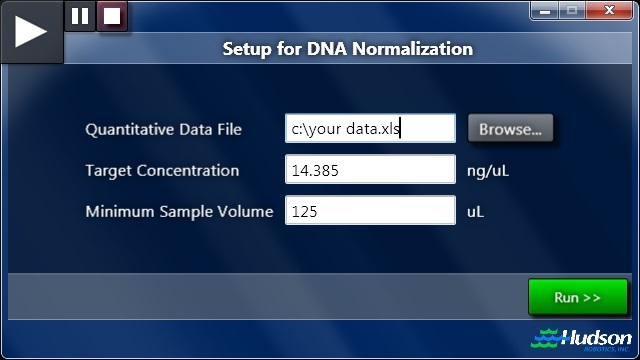 Constant Normalized Sample Volumes (with constant final well volumes): add varying diluents amounts to destinatuion plate first, then varying amounts of DNA sample to achieve a constant final well volume. Prompt the user to plate an intermediate plate on the deck to allow a dual dilution of samples where the initial concentration of DNAS is too high to achieve the desired concentration in only one dilution step.